The Chinese get credit for a lot of things: fireworks, the printing press, bird flu (do not want).... But some things that everyone thinks are Chinese, aren't really Chinese. Here are just a few examples. Iran's New Jet Can Fly (In Photoshop, At Least)! You really start to get the feeling that some of these less-friendly nations aren't even trying anymore. We recently covered how North Korea tried to scare the bejeezus (technical term) out of the States with an incredibly strange movie about a man dreaming of the nuclear annihilation of America, except they used video game footage to produce it. This wasn't the first of such instances, but you begin to get the feeling that the attempts, at best, are not getting any better and, at worst, are getting even more lame. As someone who grew up in the 80's, I have to pine for the days when a possible enemy nation really put in the effort required to scare the hell out of me. The USSR did this extremely well, causing more people to build almost-certain-to-fail bomb shelters than The Discovery Channel would know what to do with. Each silly attempt only makes me shake my head, mostly because I have to wonder who these guys think they're going to fool in the era of the internet and its global group of fact-checkers. Which brings us to the new fighter jet, unveiled by Iran and named the Qaher-313, which could well actually be able to fly, but you can't know that from the photoshopped pictures released to state run media. 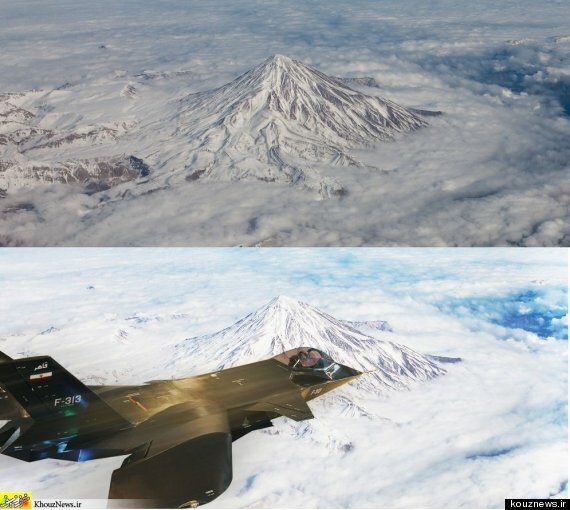 Here's a comparison between a stock image of Mount Damavand, a well-known natural landmark in Iran, and a suspiciously similar image with the new jet flying over it. Look, it's not that the jet doesn't look pretty sweet flying over Mount Damavand, it's just that if the majority world opinion is that your country is still using Russian war technology because you can't build working models on your own, an easily-discovered photoshop of your plane... you know... actually flying probably isn't going to impress anyone. Put some effort into it, guys. At least figure out a way to alter the cloud formations, so they aren't identical. The record labels have a long history of knowing how to manipulate key numbers to their advantage. Look how labels have manipulated the various charts over the years and you'll find that it's a big part of how they do business. So it probably struck little by surprise to hear that the labels were now being accused of massively manipulating YouTube view counts to make certain songs look a hell of a lot more popular than they really are. The only problem? It's not actually true. That meant high-profile videos that once lived separately on the Universal and Sony YouTube channels have been relocated to Vevo. As a result, the views that those videos received during their time on the dedicated label channels were taken away in YouTube's latest "clean up" effort. In other words, those views happened; they weren't "faked" or even double counted when they went on to Vevo. But because the videos are no longer on the channel, YouTube considers them "dead videos." They still live on in YouTube, just under a different channel. Considering how many people have been sending this story over, I know lots of people would like to believe Sony Music and Universal Music faked 2 billion views and were now being punished for it, but it's just not the case. Can A Computer Pick Out Fake Online Reviews When Humans Can't? It's no surprise that there are a ton of "fake" reviews online of just about anything that can be reviewed. Businesses, hotels, authors, musicians, etc., all want to make sure that whatever it is they're selling, people see good reviews when they go searching. But, of course, that's a problem for consumers who rely on such fake reviews... and on the sites who host such reviews and want them to be as accurate as possible. So it's fascinating to see that some researchers at Cornell (yes, my alma mater) were able to come up with an algorithmic way to figure out what reviews are fake. You can read the full paper here (pdf). It's only 11 pages. To solicit gold-standard deceptive opinion spam using AMT, we create a pool of 400 Human- Intelligence Tasks (HITs) and allocate them evenly across our 20 chosen hotels. To ensure that opinions are written by unique authors, we allow only a single submission per Turker. We also restrict our task to Turkers who are located in the United States, and who maintain an approval rating of at least 90%. Turkers are allowed a maximum of 30 minutes to work on the HIT, and are paid one US dollar for an accepted submission. Finally, we balance the number of truthful and deceptive opinions by selecting 400 of the remaining 2,124 truthful reviews, such that the document lengths of the selected truthful reviews are similarly distributed to those of the deceptive reviews. Work by Serrano et al. (2009) suggests that a log-normal distribution is appropriate for modeling document lengths. Thus, for each of the 20 chosen hotels, we select 20 truthful reviews from a log-normal (left-truncated at 150 characters) distribution fit to the lengths of the deceptive reviews. ... we find increased first person singular to be among the largest indicators of deception, which we speculate is due to our deceivers attempting to enhance the credibility of their reviews by emphasizing their own presence in the review. Obviously, it's just one bit of research, but apparently those involved in it have been contacted by... well, just about everyone doing online reviews. Hopefully this means that we're not too far off from better quality online reviews. Are US Scientists More Likely To Fake Research? Yeebok Shu'in points us to a report claiming that US scientists are "significantly more likely to publish fake research." Of course, from the writeup, it's not actually clear if that's true. The study involved going through PubMed and looking at every paper that had been withdrawn between 2000 and 2010. There are two reasons why such papers are withdrawn: due to an error or due to fraud. The study did find that the largest number of retracted papers had someone from the US as their first author... but nowhere does it say what the percentage of the overall papers in PubMed are published by US authors. So it's hard to say, just from what's been reported, if US researchers are really more likely to withdraw papers. Honestly, for a scientific publication, the article is a bit weak in leaving out the details. It's entirely possible that the rest of the data is in the actual report, but Science Daily's writeup doesn't provide enough info. The one stat it provides that is interesting is that 53% of the research withdrawn for fraud came from repeat offenders, while only 18% of the papers withdrawn for errors came from repeat offenders. Given the overall numbers, this actually suggests that fraud really isn't all that prevalent. A total of 243 papers overall were found as fraudulent over a ten year period, which represents about two per month. Perhaps that seems like a lot but given the number of scientific papers published that actually seems relatively low. Perhaps too low to read too much into the details. Twitter Banning Satirical 'Fake' Versions Of Politicians? It's certainly become popular on blogs and on Twitter to create "fake" satirical versions of various famous people. These are usually humorous (or they try to be) over-the-top representations of these celebrities. Usually, they are quite obvious, even to the point of saying that they are "the fake so-and-so" or clearly stating in the bio that this is fake. There should be no confusion around such things. However, a journalist in India who created a "fake" satirical Twitter profile for Indian politician Shashi Tharoor has found herself banned from Twitter without any explanation or chance to appeal. Now, obviously it is Twitter's right to decide whether or not to shut down certain accounts, but you would think with such an obviously fake profile that the company might be a bit more careful and, at the very least, communicate with the account holder about the issues with the account before just shutting it down. The NY Times recently had a blog post noting that the makers of an $850,000 romantic comedy called X's and O's were thrilled that their movie was widely shared on file sharing networks, because the attention it got helped land them a big DVD distribution deal, and potentially a television deal, helped along by the attention received from that file sharing. Of course, there's just one little problem. The FreakBits guys noticed that the number of downloads the movies' creators are citing are almost certainly false. Apparently some sites post fake download numbers as a part of their advertising, and the movie makers used those fake numbers. But... it seemed to get them attention to get more deals, so more power to them. No matter what, it suggests that (once again) obscurity is a much bigger problem than piracy.